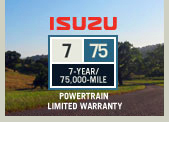 At Isuzu, we believe the measure of true performance and value starts long after that new-car smell fades away. For decades, Isuzu vehicles have been designed, built and tested for the long haul. Which helps explain how we can offer such impressive Powertrain Limited Warranties that cover their most expensive and essential parts. For specific details on the SUV or pickup truck warranty that protects your Isuzu vehicle, start by selecting your vehicle's model year.